We are manufacturers and exporters of Magnetic Equipment such as magnet plates, magnetic pulley, magnetic humps, magnetic bars and grills, magnetic traps and magnetic drums. 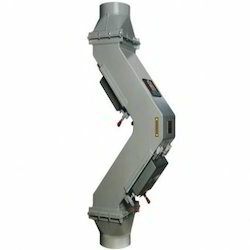 We offer qualitative range of Magnetic Humps, these are particularly designed separators for rectangular chutes or round pipes where flow speeds and deepness surpasses the capacity of plate magnets. Our range of magnetic humps is recommended in case if the flow is vertical, or if the angle of the chutes exceeds 70 degrees. The angular shapes of the housing carry out the powdered or coarse material straightaway against the plate magnets. The product flow strikes the first magnet and later on alters the course to strike the second magnet and helps in better separation as compare to conventional chutes separation. Even if product flow is light, on magnet in the half hump design may well give enough separation. Apart from fabricating standard range, we also offer our customers the facility of customization. 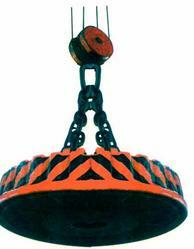 We are manufacturer, exporter of Lifting Magnet for metalic segregation purpose on industrial level. Looking for Magnetic Equipment ?